compatible out of the box for this price, it's not very hard to implement. Other Thoughts: I would recommend this product to anyone more concerned with image quality than speed. If I had to buy another monitor for some reason and had the money I'd probably buy it again. I do really feel like it should be VESA compatible though. Pros: Great picture quality & colors. Good for gaming. 2k in 25 inch monitor makes pixels unnoticeable from a normal viewing distance. no dead pixels. Cons: Black light bleed is very noticeable when the screen is completely black. People complain a lot about the build quality but to me is acceptable and if you have a sturdy desk you will not complain about wobble. Its made of shiny plastic which I personally don't like. I see some straight lines on a white screen. Pros: - I purchase three of these for an Eyefinity setup and they look OUTSTANDING!!! - The PERFECT DPI/Resolution/Size for Windows 10. They default to %100 scaling, so everything is Crisp & Clean!! Other Thoughts: I would Highly Recommend this product. These can be overclocked to 75Hz, but honestly... I don't see the point. They are Great for content creation, general desktop tasks and games look great as well. No complaints, would definitely buy again. Cons: - Died prematurely and only 5 months out of warranty. Started flickering randomly before this but I thought it might be my graphics card / display drivers. I should have returned it sooner. Pros: When they work, they get the job done I guess. Cons: I've bought three of these monitors and they've all have the same issue - the screens will randomly start blinking on and off for no reason and I'll have to turn them all off and back on again to get them to stop - and sometimes that doesn't even work. I also had another one that I bought refurbished which came DOA with horrible screen corruption and non-functional ports. Other Thoughts: I don't plan on ever touching these type of monitors again. Seeing how horrible they've behaved, I wouldn't want them if you gave them away. -Works seamlessly with MacBook Pro. - The stand is very poor, monitor shakes even with a little bump on the table. Other Thoughts: Extremely disappointed. For heaven's sake how come a brand new monitor have dead pixel? 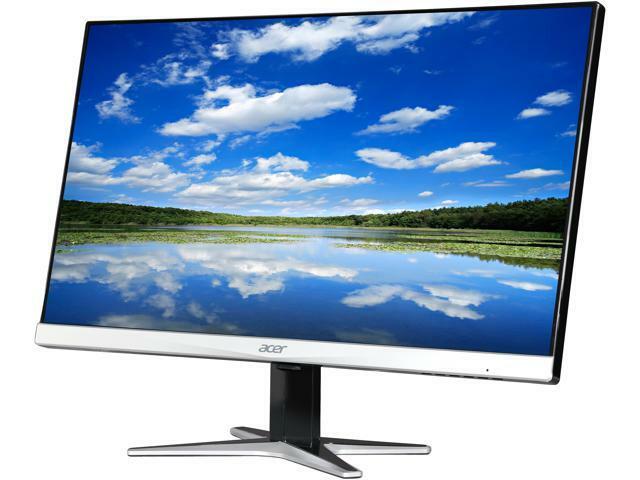 your Acer G series monitor and we understand this is frustrating for you. This is not the experience we want our customers to have with their products. Pros: You own a MacBook, this will do exactly what you have looked for out of the box. Cons: Just installed it but haven't found any problem YET. Other Thoughts: If you are looking for a second monitor for your Retina display Mac, this is the right item for you.